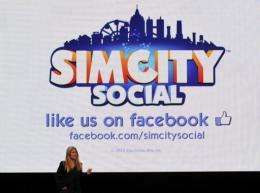 Lucy Bradshaw GM of Maxis presents Simcity integrated into Facebook during the EA (Entertainment Arts) media briefing in June 2012. Electronic Arts said Friday it had filed suit claiming Zynga's game "The Ville" illegally copied the life simulator "The Sims Social." US videogames giant Electronic Arts said Friday it had filed suit claiming Zynga's game "The Ville" illegally copied the life simulator "The Sims Social." "The core legal issue is our belief that Zynga infringed copyrights to our game, The Sims Social," said Lucy Bradshaw, general manager of EA's Maxis label. "The legal reasons are solid. But for creative teams who feel that their hard work and imaginations have been ripped off, there's obviously an emotional element too." Bradshaw said that when Zynga's game was introduced in June "the infringement of The Sims Social was unmistakable to those of us at Maxis as well as to players and the industry at large." She added that "the copying was so comprehensive that the two games are, to an uninitiated observer, largely indistinguishable. Scores of media and bloggers commented on the blatant mimicry." Zynga, a social games maker which grew from the Facebook platform, did not immediately respond to a request for comment. Sims Social is among the life-simulation games from Silicon Valley-based EA. The Ville, one of the top games played on Facebook, has been described as "very similar" to The Sims Social but "not a complete clone" by a reviewer at the website Inside Social Games.